Sorbus sargentiana is a magnificent, tough and slow growing tree ideal for small gardens. Reaching just 4 x 3 metres in 20 years, Sargent’s Rowan is certainly not short on features though and provides interest through spring to autumn. From among the deep green, pinnate foliage, corymbs of creamy white flowers emerge in May-June that are particularly popular with foraging bees. For autumn, the green leaves turn striking shades of scarlet, providing an intense, seasonal display. Following this are bunches of orangey red berries that hang onto the branches into winter until the birds devour them. Sorbus sargentiana can cope with most soils and conditions, including partial sun and exposed positions. 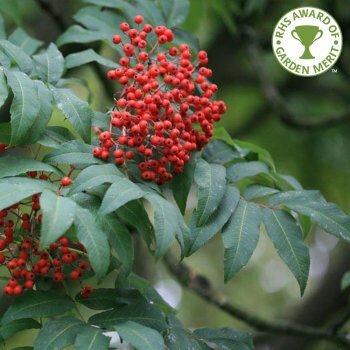 With the RHS Award of Garden Merit, this Mountain Ash is a great choice when there is room for only one tree as it really does have it all. Our pot grown Sargent’s Mountain Ash trees can be planted at any time of the year. Start by removing weeds and grass within a metre of your desired planting hole. Dig a square hole as deep as your root mass and approximately 2x as wide. To help Rowan establish more effectively, sprinkle root grow in the hole. We recommend planting Rowan trees with a stake and tie kit. For single stakes, place the stake at an angle to avoid penetrating the rootmass and knock it in until it is firm. Use a buckle tie, placing the spacer between the stake and tree. If you’re planting Rowan in spring or summer, water well for the first few months. Increase watering if there are extended periods of hot or dry weather. If planting in autumn, you may only need to water a little. Irrigation kits make it easier. Sargent’s Mountain Ash trees require a strong framework to support their colourful berries, so encourage this by raising the crown in summer. Simply prune the lower branches and any crossing, damaged or diseased branches within the crown. Hard pruning of Rowan trees can be carried out in the dormant season, from autumn to winter.